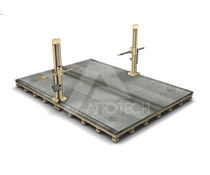 ☞ ATD Model is consisted of 2 main body and one cast iron surface plate for marking work and 3D measruing. 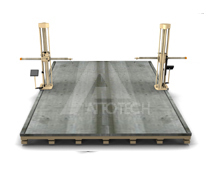 ☞ Main body move on top surface guide rail of cast iron surface plate. ☞ ATD Model is made for very big measruing and working range industry. ☞ ATD Model is a very simple standard specification and enables to select an extra knob and a fine feed according to the purpose. You can do work very comfortable in using this layout machine. ☞ We can recommend this model with manual machine. ☞ We are ready to support various systems to the specifications you needs, such as precision and work size. ☞ Marking and Measurement of Sheet Metal Components,Car Body, Dies and Fixtures etc. ☞ Reverse engineering, Digitizing & Inspection of large and heavy components. ☞ Styling and Milling Application. ☞ Clay models making, measuring of graphic data. 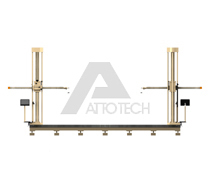 ☞ Measurement of master-models, wooden or metallic moulds.